Inklings of wit and inspiration in works by four choreographers. 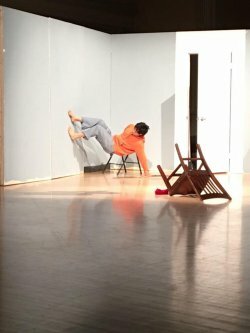 There are relatively few venues, even in dance crazy NYC, where fledgling choreographers can work on their craft in a totally professional environment. Soaking WET at the West End Theater is one of them. Curator David Parker and producer Jeffrey Kazin run a tight, but open-minded, ship. The dances I saw, flawed as they were, had inklings of wit and inspiration. Kai Kleinbard’s “Shadow’s Shadow” was a compact, but slow moving, exploration of its title. To a soundtrack of watery effects, wind, quiet electronic sounds and whispery bits, Mr. Kleinbard, dressed in a button down shirt and rose colored pants, lit only by a single lighting instrument, crept about, keeping to the back wall. He tiptoed, crouched, tried to climb the wall and otherwise looked intensely unhappy. A second section, lit only by a hand-help lamp featured more dramatic shadows cast almost to the top of the very high ceiling of the theater. The shadow became a dark monster following the tiny real-life figure about. “Shadow’s Shadow” had the beginning of an idea not fully realized, but well executed. “The bird has more friends than me,” by Garnet Henderson was performed in silence. A trio, Rebecca Hadley, Linden Hill and Ms. Henderson, each sported at least one glittery item of clothing. “The bird…” was a cool study in relationships—spatial and personal—that went on a tad too long. Ms. Henderson did fill the space with the three performing both sequential and unison darting, twisty movements. At one point one of the three reclined on the floor, tapping her fingers while the other seemed to perform for her. Gestures also were an important part of her vocabulary with much self-touching, hair brushing and head holding. By the end of the work, it was difficult to understand just how these three registered with each other. “Emic Flux,” choreographed by Aaron Selissen in collaboration with the dancers used Zac Selissen’s wild electric guitar, performed live, as its score. The choreographer joined with Ross Katen and Kristi Ann Schopfer to create a not very happy vision of three young, good-looking people hardly relating to each other. They barely touched. They often stopped, their gazes aiming upward, their arms outstretched. Subtitled “They call themselves ‘we’,” “Emic Flux” never quite lives up to its dryly analytical title, but the three dancers move well and look good. The final work of the two programs was “Hot Knife in Cold Butter/Flo Through Me,” choreographed by Kyla Barkin (also with the participation of her dancers) to music by James Guastaferro, Kevin Keller, Max Richter and Simon & Garfunkel. She used her six dancers, adorned in Julie Michael’s dark gray tops trimmed with geometric slashes, as a small community that seemed sadly out of touch with each other. “Hot Knife” had far too many short sections which displayed Ms. Barkin’s knowledge of several modern dance techniques. Although the final two works featured the best dancing of the lot, the choreography was more than vaguely reminiscent of 1960’s college dance departments. That isn’t necessarily bad, but it isn’t good, either. 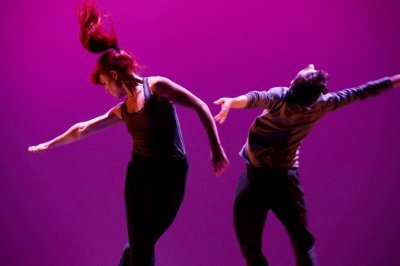 Certain trends run through the four Soaking WET dances: a loose, even non-existent relationship to music; exaggerated gestures (touching the face, reaching out, pointless head positions) substituting for movement creativity; dark programmatic or title meanings that the actual choreography could not substantiate; and repetition as a structural element. Each choreographer needs the dance equivalent of a dramaturg to edit, re-order and give structure to the work. Haejin Han’s lighting designs made the most of the space and helped differentiate the works. A fascinating look at the work of a seminal modern dance maker. Physically diverse dancers are given a chance to shine and express their inner emotions.